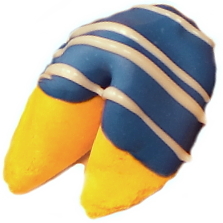 Talk about internalizing your clients’ branding…not only can we match just about any color scheme, our gourmet fortune cookies also make a delicious taste impression. When Volkswagen was planning their recent Parts & Service meeting in Dallas, they approached their Promotional Products Distributor looking for a unique and fun handout that could also incorporate a prize giveaway. 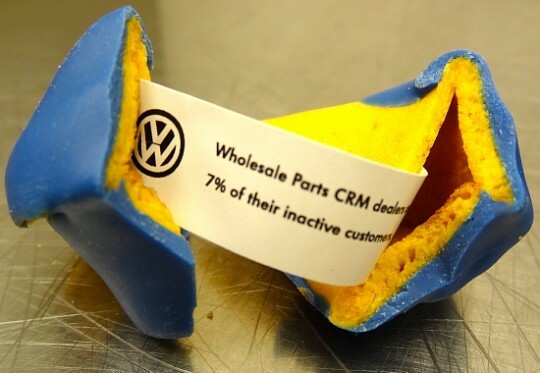 So we were contacted to create custom fortune cookies for their VW Customer Experience booth. 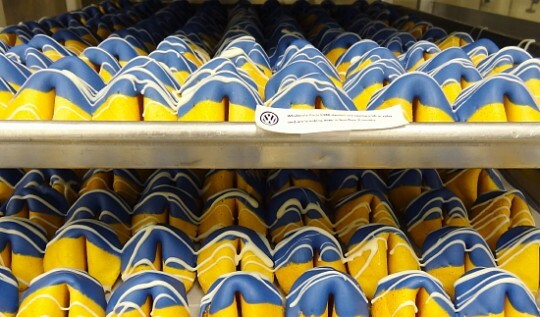 We enjoyed whipping up a custom color of blue chocolate to dip them in, and once we added white drizzle, the cookies were a great match to their classic logo. • Wholesale Parts CRM dealers are seeing a lift in sales and are breaking even in less than 2 months. • $500 off new enrollment ACTIVATE and Wholesale Parts CRM!! Must redeem at show. Our cookies are always baked fresh by hand. No shortcuts!